Whether you are a CAD specialist or graphics designer, at some point you would come across some form of 3D mouse aimed at improving your work efficiency. The popularity and knowledge of such computer accessories although considered a bit arcane can not overshadow the efficacy of these devices to the world of designing. Here we provide you with review of a product that has dominated the market in 3D mouse category and has allowed the company namely 3DConnexion to launch multiple highly successful variants. 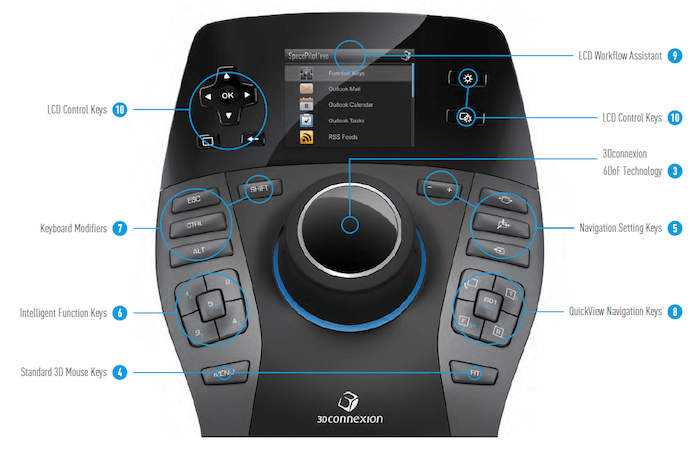 3DConnexion is a manufacturer of 3D CAD-specific human interface devices. They produce everything you could use to control your drawing environment and conquer each task with ease. Their latest products, one of which is up for review here take things way up a few notches. 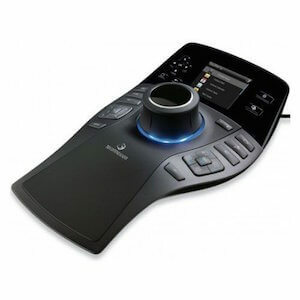 With the SpacePilot Pro, the user has the most ergonomic & flexible yet focused controller ever developed. No two are alike, but the hand-rest design is spot-on perfect. Now, I’ve never owned one myself (because it costs a lot more than freelance projects and writing about them!) but that doesn’t mean I haven’t leapt at every opportunity to use one. Whether you’re a pro-CADer and want it for your workstation or whether you are a serious hobbyist and you want it for your home-kit, the SpacePilot Pro has neat tweaks and features for every purpose. Read on to find out more. The SpacePilot Pro is a sight for sore eyes. Not only is the shape extended in response to the hands placement and structure, its flow is even with the top half in glossy plastic holding an LCD. The patented 6DoF (6 Degrees of Freedom) sensor sits in the middle with its blue neon glow beneath it. The top half has an LCD that allows you to assign different icons and tasks right from the LCD. If your email is configured, arriving emails will be displayed with the sender name and email. Other menu options include configuration shortcuts and widgets dedicated to applications such as CATIA, SolidWorks or AutoCAD. The function key applet shows how the intelligent keys have been assigned. The full color LCD provides quicker access without you having to switch screens to check up on background activities. On the LCD’s sides are a number of buttons for miscellaneous tasks. Further down to the right side are Navigation Settings keys. 3 keys in total allow you to lock axis for accurate movement. The dominant key restricts access to a certain axis for axis-specific movement. The translation key switches translation settings on or off allowing the model to be rotated only. The third key turns rotation off allowing you to stick to one view while panning zooming or changing angles. Just below are the QuickView keys with dual functionality set to manipulate the view and set it to predefined positions. With the long & short press you can switch between the primary and secondary function of the button, where one button supports a 90˚ (anti)clockwise rotation, the other switches the view to different positions with the ISO1 & ISO2 views already set. On the left side of the sensor is a keypad entitled the “Keyboard Modifiers”, with the Shift, Escape, Control (CTRL) & Alternative (ALT) keys for you to press without reaching for the keyboard. Following that down under, the Intelligent Function keypad. With 5 keys and the same long & short press switching mechanism you can program those 5 keys for a total of 10 different function available at the touch of your pinky. In total there are 31 programmable keys with a virtual numeric pad so you don’t have to shift to the keyboard for entering dimensions and other values. The packaging contains one device, drivers, demos and tools for hooking it up. Windows, MacOS X and Linux are all supported flawlessly, with profiles created for Blender and other nix-based software also. A 3-year warranty makes it a must have, want and need for every professional who will be using it. And of course, those who can afford it. The device is moderately expensive, but pulls its weight hence is a budding demand in the CAD industry.